Today was one of those days when all I wanted was to be outside and away from the condo. The previous week was blocked with the beginning stages of the renovation on my hallway bathroom. After five years of living in the condo, it is time for me to grow up. Although the complete renovation of my condo unit will be over the period of a few years, it is necessary. And as my neighbourhood is starting to feel the introduction of gentrification, property value will increase and it will be a good idea for me to upgrade my condo accordingly. But back to my original thought, I needed to escape so that cabin fever did not have me inside having a panic attack. 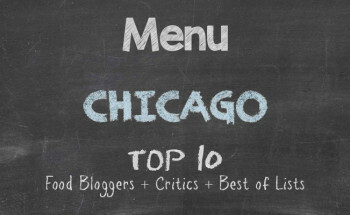 I had covered a lot of ground in terms of restaurants that I had wanted to post and there are still some that I am holding off for later dates — special dates that have meaning and significance. A lot of time had passed since I was last in Hyde Park — or rather New Hyde Park now after seeing so much change — so I made that my destination. Thankful for good parking karma, I secured a spot not far from my favourite Thai restaurant in Hyde Park. Thai 55 at 1607 55th Street was my stopping ground for putting my feet under the table for some aroy Thai. Now, I know that I have Thai restaurants galore on Chicago Alphabet Soup, but that is one cuisine I doubt I will ever tire of eating. Besides, it was Thai food that became my main staple when I was bringing my high cholesterol down — successfully — without medication. But for today, I was also going to see my great pheụ̄̀xn — friend — Wongchana for our usual discussion about politics, faulty religion, community awareness, and social consciousness. At the same time, I got to rehearse my Thai. First, to get the tummy ready, I ordered ginger tea. This was not tea in the bag, no. This was a pot of chopped ginger root that I let steep in boiling water for at least five minutes. The kick of the ginger was all I needed to know that I was preparing my stomach for a good lunch. 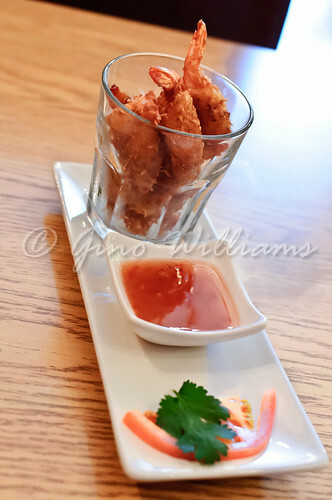 For an appetizer, I had coconut shrimp with a spicy plum sauce. Any time I have had shrimp that looked as plump as what I had, it turned out to be a morsel of shrimp hidden inside of a ridiculously thick façade of crust. That was not the case here. Then came the basil chicken. My common Thai entrée preference has always been a curry dish, be it gang dang gai, panang goong, or gang gari gai. Clearly I was in a different mode today, although sticking with a spicy dish. Thai chillies, red and green peppers, shredded cabbage, and ground chicken simmering in a slightly sweet — not saccharine — brown gravy made my lunch moment worthy of this blog posting. Served with jasmine rice, I was quite satisfied for settling for this option. 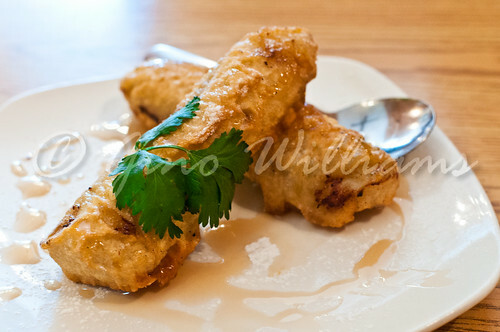 While my friend and I sat and talked, and oh can we talk, out came a dessert of fried banana with a light caramel glaze. They had read my mind. You know that you have established more than just a customer-client relationship with a restaurant, but you have formed a family bond instead when the wait staff knows a certain dish or dessert to bring to you. Mind you, my two favourite Thai desserts are sticky rice with mango and Thai custard. Nevertheless, I polished off the fried banana and ginger tea while giving my conspiracy theory about the Benghazi disaster and how I think that private contract firms have no business involved in managing national security interests. Thai 55 may be one of my all-time favourite Thai restaurants in Chicago for sentimental reasons. As I had mentioned, this was where I started learning to speak Thai. I thank my great friend Wongchana for that. Imagine an African-Caribbean man such as me speaking something more exotic and fascinating than my own mother tongues. Because of the close relationship I have with all who work at Thai 55, it is unfair for me mention how great the service is. To me, it is simply outstanding by default. The quality of food is the next big item I seek in restaurants and I have never had a dish at Thai 55 that I found displeasing to my palate. It sounds rather fantastic saying that especially after close to, if not more than, ten years of being a regular patron of thier cuisine. But don’t just take my word for it. 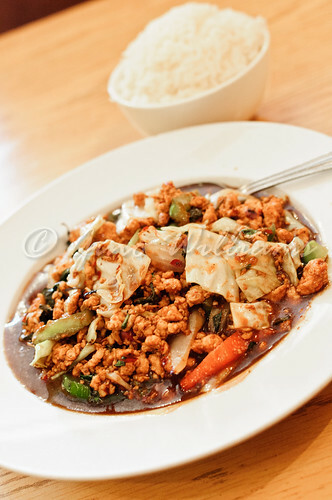 Go and discover for yourself that all is good and aroy at Thai 55.